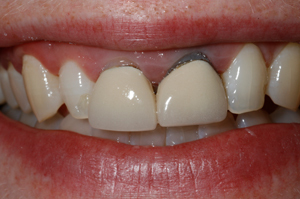 The contour of your teeth or ‘uneven gums’ is an important consideration as part of a cosmetic smile assessment. When you are planning any cosmetic improvements of your smile, one must also consider the soft tissue that “frames” our teeth, known as gingiva or “gums”. 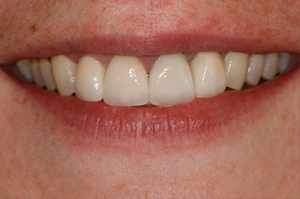 Your smile assessment will include this important aspect of your smile makeover. Simple procedures such as gingival contouring or cosmetic crown lengthening, can provide such a dramatic difference in the overall appearance of an individuals’ smile. This procedure is most commonly performed by a cosmetic dentist like Mark or a periodontal surgeon. It can correct an uneven or asymmetric gum line, exposed root surfaces and teeth that appear “too small”. The patient below shows how the original teeth appeared too short. So as part of a cosmetic makeover the gums of the front four teeth were lengthened and then four new All Ceramic Crowns and veneers were provided to provide a wonderful new smile!